The European Union Chamber of Commerce in Korea (EUCCK, www.eucck.org) announced the election of Mr. Carl-Johan Hagman as the new President of chamber. He replaces Mr. Frans Hampsink, effective Wednesday, November 1st, 2006. 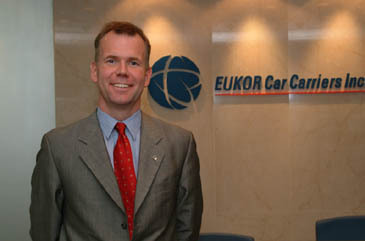 Mr. Hagman is the Chairman, President & CEO Eukor Car Carriers Inc., a leading RoRo shipping company headquartered in Seoul, with a turnover of about $2 billion, operating 100 ships with offices or representatives in over 60 countries. A Swedish national, Mr. Hagman has spent 8 years in the country and was also recipient of the Medal of Industrial Merit from President Roh Moo-hyun in 2003. 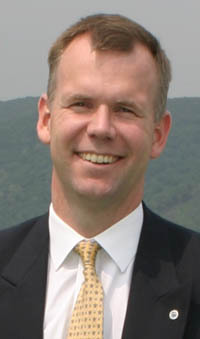 Prior to heading EUKOR, he was President & CEO of Wallenius Lines AB, Sweden, an international industry leader within the shipping and logistics field. He was first posted to South Korea in 1996, as Owner's representative, and later President of Wallenius Lines Korea. He did his Master of Law (LL.M.) from Universities of Lund, Sweden and Oslo, Norway, majoring in maritime and environmental law. From 1984 to 1992, he held several positions in the Swedish Navy, as a Lieutenant Commander. Mr. Hagman expressed delight on his appointment and said: "It is my firm ambition to help European companies be successful in Korea as well as supporting Korean companies in Europe. Europe and Korea have much in common and are natural partners in a globalized world." Mr. Jean-Jacques Grauhar, Secretary General, EUCCK, welcomed the nomination of Mr. Hagman and said: "We look forward to the further development of the EUCCK, under his able leadership. I am sure under his presidentship, EUCCK will be able to forge greater trade, commercial and industrial relations between the EU and Korea ." The EUCCK would also like to express deepest gratitude to Mr. Hampsink for his outstanding contribution to the Chamber. We look forward to his continuous support in his capacity of Honorary President. Swedish Naval Academy Higher Course, promoted to the rank of Lieutenant.-Commander or "kapten"
For further details contact: Ram Garikipati Tel. 725-9916 or Choi Eunjin Tel. 725-9915.